FRED E. BEACHY LUMBER CO. 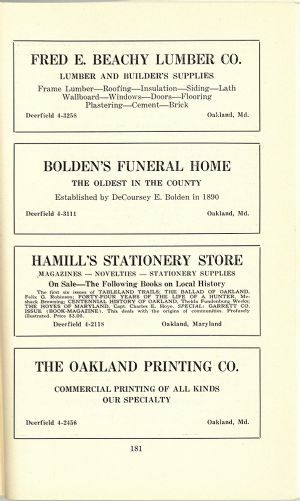 The first six issues of TABLELAND TRAILS; THE BALLAD OF OAKLAND, Felix G. Robinson; FORTY-FOUR YEARS OF THE LIFE OF A HUNTER, Meshack Browning; CENTENNIAL HISTORY OF OAKLAND, Thekla Fundenburg Weeks; THE HOYES OF MARYLAND, Capt. Charles E. Hoye. SPECIAL: GARRETT CO. ISSUE (BOOK-MAGAZINE). This deals with the origins of communities. Profusely illustrated. Price $3.00.